In 1890, Arthur Kennelly, an electrical engineer working for Thomas Edison, wrote a letter to the director of the Lick Observatory. He described an interesting experiment being undertaken by the great inventor that may have been the first radio telescope — forty years before its official invention. 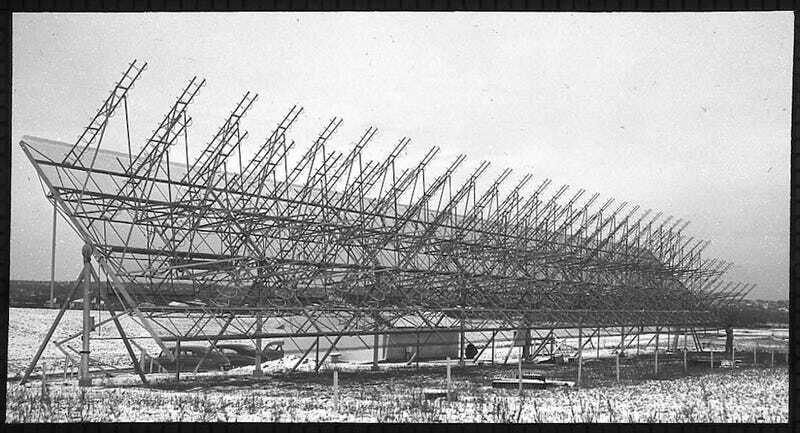 History shows that the first radio telescope was built in 1931 by Karl Jansky, an engineer working for Bell Laboratories, in an effort to discover the source of interference in transmissions. He identified that the origin of the interference was the Milky Way. Five years later, amateur astronomer Grote Reber applied this technique in the first application of a new branch of astronomy that became known as radio astronomy. Still, there are tantalizing hints that its birth may have come almost 40 years before. In his letter about Edison to the director of Lick, Kennelly said the inventor had turned his mind to solar physics. Along with the electromagnetic disturbances we receive from the Sun," he wrote, "which, of course, you know we recognise as light and heat" Edison had decided that it was "not unreasonable to suppose there will be disturbances of much longer wavelength." If this were to prove true, Kennelly said, "we might translate them into sound." Edison's plan was to employ a huge mass of iron ore. Around this he would erect a series of wooden poles. From these poles would be a cable consisting of seven carefully insulated wires, the terminals of which would be attached to a telephone or similar apparatus. "It is then possible," Kennelly wrote, "that violent disturbances in the Sun's atmosphere might so disturb either the normal electromagnetic flow of energy we receive, or the normal distribution of magnetic force on this planet, as to bring about an appreciably great change in the flow of magnetic induction embraced by the cable loop." Edison suspected that such electromagnetic disturbances would be associated with sunspot activity and hoped that Lick Observatory would be able to provide information as to just when these occurred, since Edison and Kennelly would not be able to establish a connection "unless we have positive evidence of coincident disturbances in the corona." Unfortunately, there is no evidence one way or the other whether Edison ever carried out the experiment. If he had, it probably wouldn't have worked. Edison's proposed apparatus would have been very insensitive, capable of detecting only very long wavelengths—and the ionosphere prevents such long waves from reaching the earth's surface. Ironically, it was Kennelly who went on to co-predict the existence of the Heaviside Layer, which accounted for this effect.